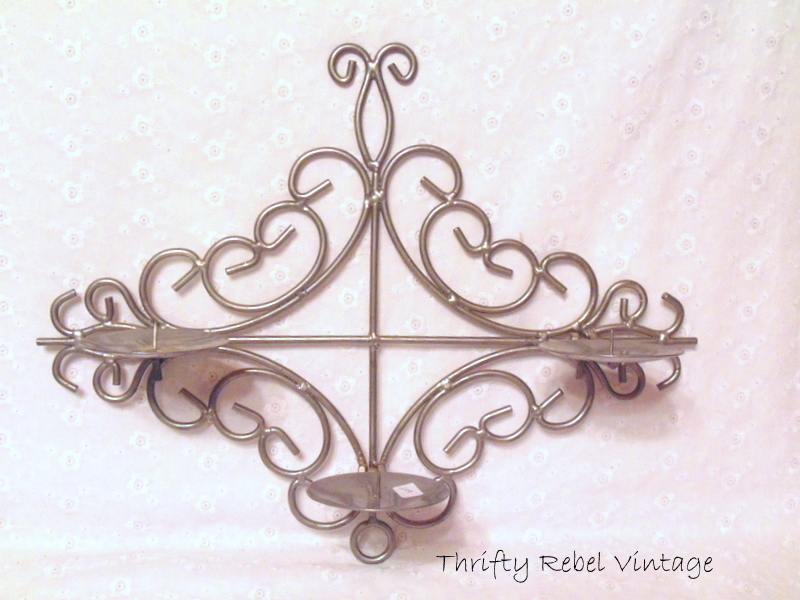 You are here: Home / Thrifted Finds / Thrifting again… and loving it. Thrifting again… and loving it. So after I cured myself of my thrifting cure I went back out into the thrifting world this past week to see what I could find. Since I hadn’t been out for about 3 weeks there was a lot of new-to-me stuff on the shelves. Maybe that’s the trick… going less often, but I’m also being pickier about what I bring home. I can’t resist wooden rolling pins, but I’ll only buy them if they’re $1 or less. I have 7 or 8 now. I have ideas of how to use them, but just haven’t gotten to it yet. This winter maybe. The cream horn baking forms need to be repurposed into Christmas ornaments. 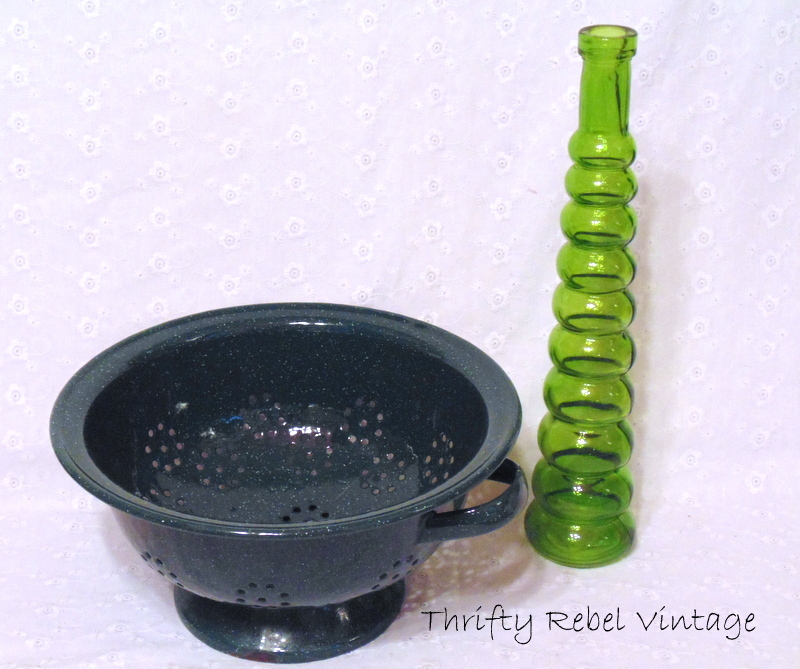 This dark green speckled strainer is in great shape, and I love the colour and shape of this glass bottle. 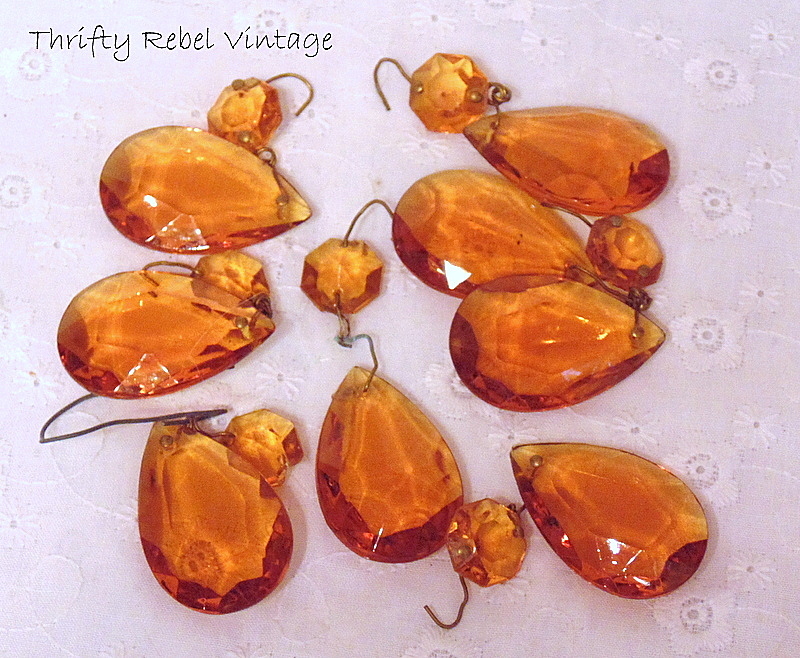 I’ve never seen copper coloured glass chandelier crystals so I had to grab these. I wish there were more, but this was it. Perfect for a fall project. I rarely find decent music books, but there were some just waiting for me. 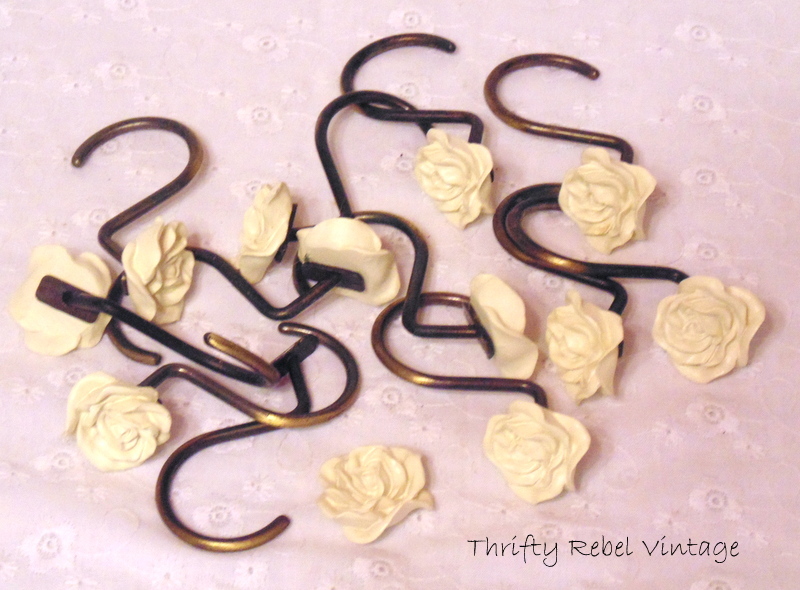 I bought these shower curtain rings for the roses, which I’ve already broken off so I can use them in projects. I don’t think this is vintage, so I won’t have any qualms about giving it a makeover. Can you picture teacups on those candle holders? 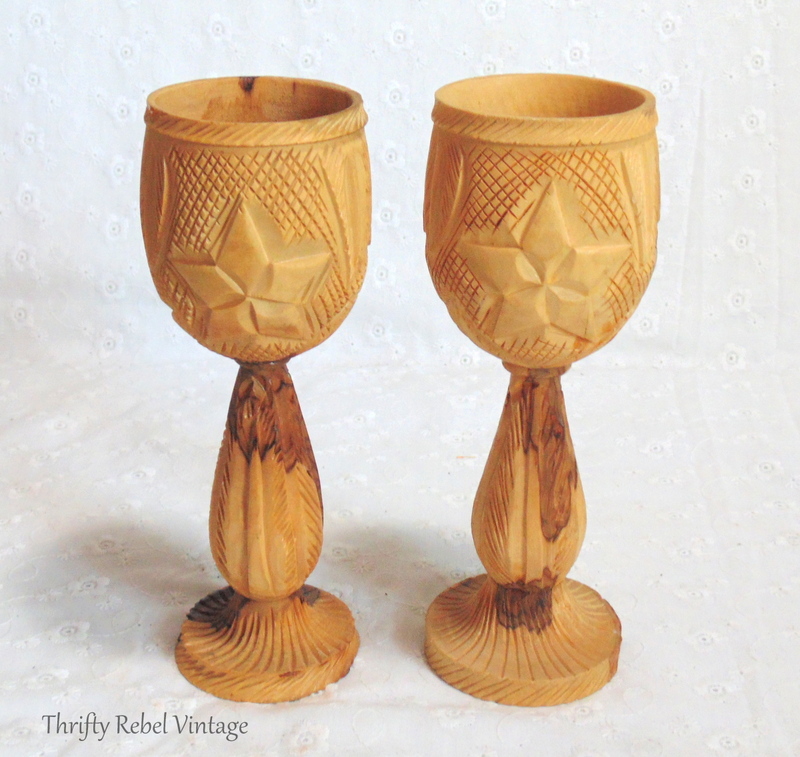 These hand carved wooden goblets are another first for me. I’ve never seen anything like them before. I’m not sure you’re actually supposed to drink out of them, but they are pretty cool. 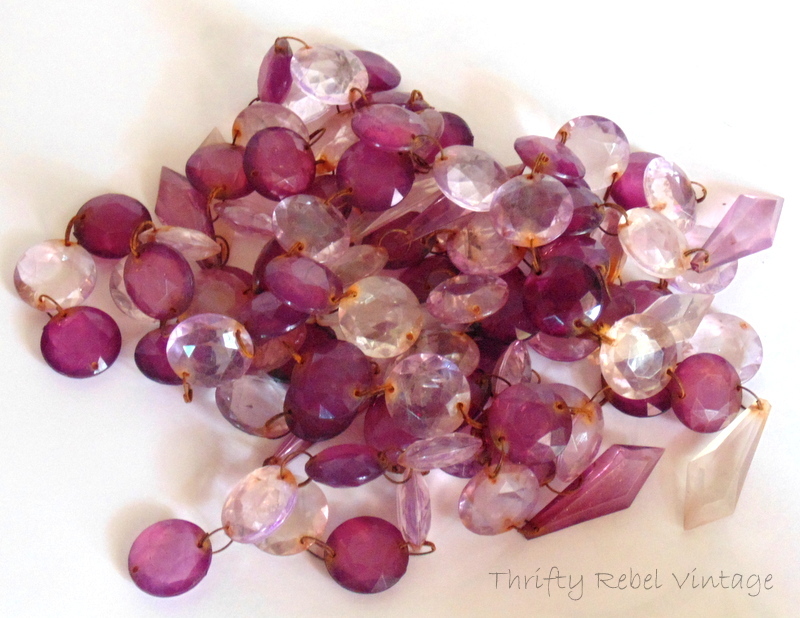 And last but not least, these lovely purple chandy crystals. They’re plastic, but still very pretty. I have to remove all the rusty split rings and give these a good cleaning and then they’ll be perfect for a project or two… or three. It’s quite the bunch. What do you think of these Dona? Are they purple enough? You really hit the mother load of good finds. 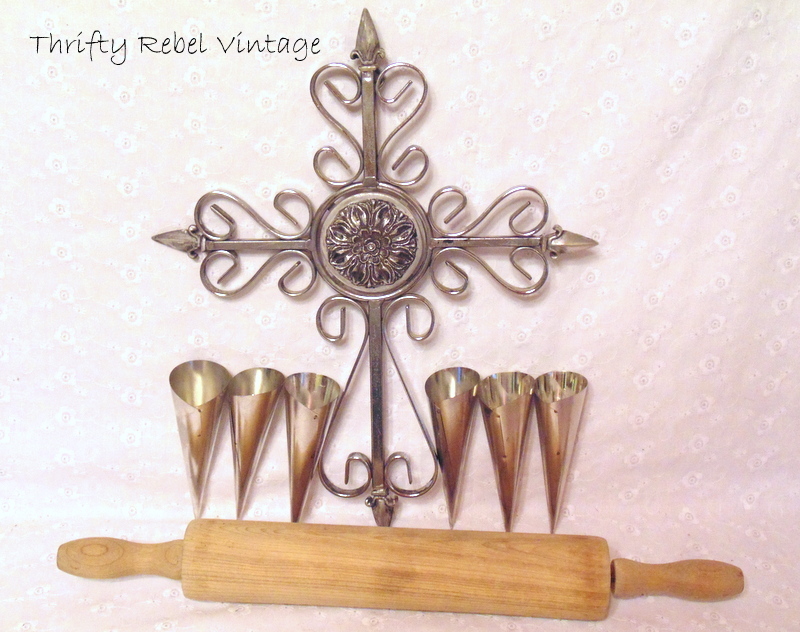 I am excited to see the gorgeous Christmas ornaments you create but very curious about your rolling pins. What clever idea will you come up with? Love all your finds . You scored big!! Music books are a real treat! I found some once and bought them all to share with my sister. A buck each! Have a great weekend Tuula. Wow Tuula you found some great things. I have never seen amber crystals either. Those are pretty cool. I know you will be transforming these loves into new fun things. I usually find the most fabulous stuff after I haven’t been thrifting for awhile! You hit it just right….lots of goodies to repurpose! Love the amber crystals and the purple ones are so pretty too! I have been busy making two teacup bird feeders and finding parts to make a garden flower! You found some more interesting items. I’m curious about your plan for the wood carved goblets. They’re cool. I hope you continue your blog for a very long time. I enjoy following along and seeing your fun ideas using these great flea finds. If you never do anything with the wooden chalices – I would most definitely be interested in them. The star ingraved on them is a Pentacle and they were used for Pagan ceremonies. Thanks Sue! That’s so interesting. If I decide to part with them I’ll be sure to contact you. just found your blog today. Am enjoying reading through your entries. LOVE the Church Organist book. 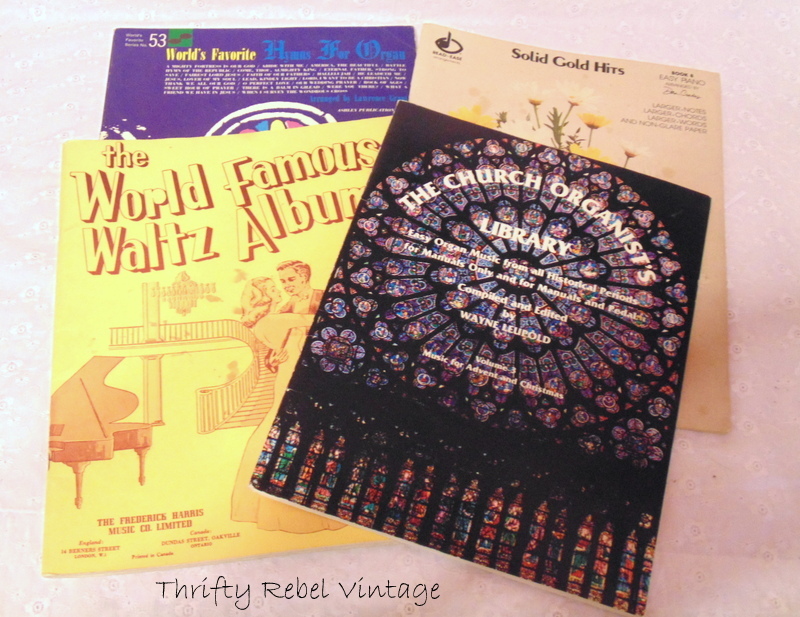 I have just recently also found some great thrift-store music books, how fun they are to find. My retirement job (after multiple years as RN) is part-time job as church pianist/organist. What a different type of ‘job’ – I am enjoying learning and playing new (to me) songs. Hope you play and enjoy those books. Thanks Jan! What a fun job you have. Enjoy!